If you want to boycott Poland, buy this Bulgarian wool blanket instead! These don't have a strong smell and are wonderfully plain in colour as well. Before the time of sleeping bags, virtually all armies issued wool blankets to soldiers. Even today a wool blanket has its virtues: it's robust and fire retardant, easy to care, easy to throw on like a cape and allows rapid deployment in case of an alarm. Of course sleeping bags have a way more better warmth-to-weight ratio than blankets, never forget. Measures roughly 200 x 160 cm, can vary a bit, weight about 1,5 kg. These blankets seem fully woollen or maybe with a small amount of acrylic. It lets moisture through to keep you dry, but provides some insulation even when wet. Although if you find yourself trying to sleep under a wet blanket, you probably did something wrong. These seem unused or at have seen bunk use at most - definitely never fielded in rough conditions. The only smell we could detect was a hint of naphtalene. I'd never used blankets for camping until recently. After purchasing these (x2) my sleeping bag has now been ditched in favour of a bed roll containing these blankets. I really wanted to like those blanket but this is not possible. They came (x2) quite thinly worn in places which I was ok with, since I bought them to use in a shack. They are not necessarily used, it could have been just long term storage which worn them out. However what I am not ok with, is hundreds of plastic, hard pieces-fibres embedded in to the blankets. To me it looks like those are pieces of shredded plastic bottles or something and they are of various lengths and thickness (2.5 cm-0.5 cm). Pieces of rubber bands, and strange gold and silver fibres are also present. I kept them and threw them in to the trunk as an emergency blankets, only because I hope to never suffer an emergency so hopefully I will never use them. Ei hyvä. Nukuin huovan alla sisätiloissa 22-asteen lämmössä hikoilematta oikein mukavasti. Heinäkuun 1. päivä olin metsässä telttailemassa ja lämpötila ulkona tippui jonnekkin 10-asteen hujakoille. Huopa viileni niin paljon, että se tuntui ihoa vasten hyvin vastenmieliseltä ja keräsin kiaikki vaatteeni ylle, että sain nukuttua. Painoa on reilusti. Käytännössä täysin hyödytön Suomen arvaamattomassa kesässä. Intin/savotan makuupussi on hyvästä syystä sellainen kuin on, eikä sitä tule koittaa korvata ulkomaisella hipsterihuopahömpällä - näköjään! 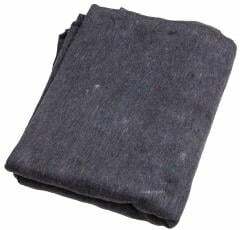 After purchasing my wool blanket and using for the spring in the cooler nights it works great and is very comfortable. I must have got lucky with mine because it's the size of a twin blanket and no issues with it what so ever. It really is all about luck when purchasing these products, but can't go wrong with the prices. I will continue to buy products from these guys for sure. Good little blankets for the price, of the three I've received there are some hard fibres but they are very infrequently spread out on the blanket. I don't notice them sleeping regardless, though they would be easily cut off or mitigated with a sheet if they bug you. Word of warning though, be careful washing and drying these as a lot of loose material may come off during the first wash if you don't use the gentle/wool cycle on them. 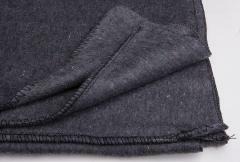 Well, it is clearly a blanket... And it is grey... And it measures like stated. The blanked had some weird plastic bits in it and must have been stored in an fueltank for the last decades. Could power a Leopard 2 based on the smell and the fumes of this piece of fabric. Its worth spending the extra ten bucks for an US blanket.